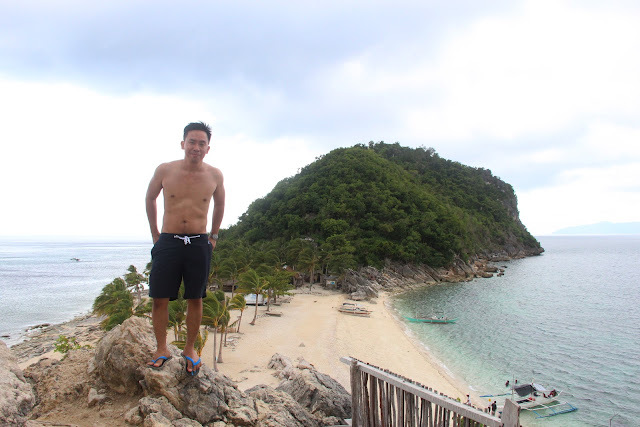 This weekend I flew to Iloilo to explore a place that’s just starting to bubble up in traveler’s radars – the Isla Gigantes group of islands. 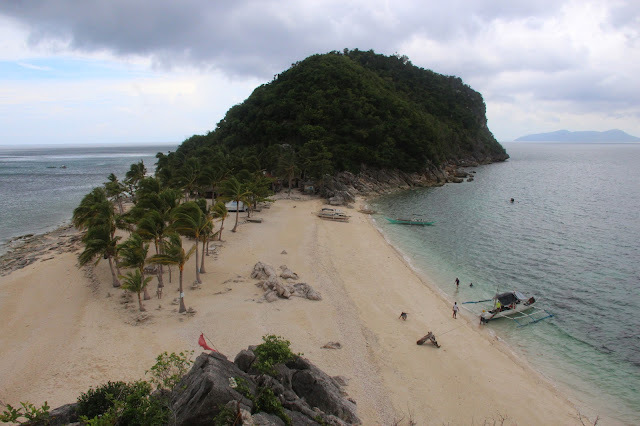 Located in the Visayan Sea, the Isla Gigantes group of islands is composed of ten islands, the main two being called Gigantes Sur and Gigantes Norte. 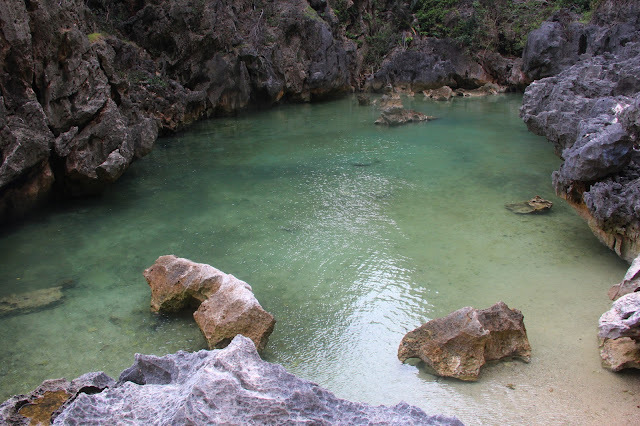 It is part of the municipality of Carles in Iloilo province. I started my journey to the islands on Saturday morning (I arrived in Iloilo the day before and spent the night there), taking a bus directly to Carles. The trip took about four hours. I took a motorcycle ride to Bangcal Fishing Port, the nearest jumpoff point to Gigantes. There I rented a motorized banca, with just me and the two boatmen – a father and son tandem – as passengers. We set out to sea as soon as I was able to buy some provisions – water and some snacks – and after I chowed down a bowl of ramen bought from a sari-sari store near the port. I haven’t had a proper breakfast since leaving my hotel in Iloilo at 5 am. The islands are located about 18 kilometers from the mainland, and it took about an hour or so to get to our first destination, a small islet just next to a bigger one called Nabunut. We skipped Nabunut because it was low tide and apparently it was dangerous to sail there because of the exposed rocks and reef. We docked on the islet, a desert island with only small huts and and a single coconut tree on it. There were some rocks outcropping from the beach, volcanic in origin I suppose. According to Mark, the younger boatman, most of the beach disappears during high tide. The huts are used as shelter by the fishermen. We spent a few minutes there, with me getting wet for the first time, dipping into the tidal pool near the beach. The next island that we explore is the one that’s represented when you google Gigantes Island – Cabugao Gamay (gamay means small in Visayan; we skipped the island’s bigger brother). 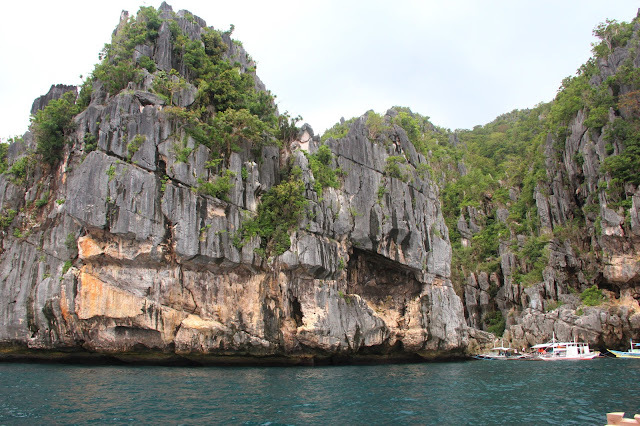 Shaped like a slightly curved “i,” the island has a white beach that’s bookended by an outcropping of limestone on each end. I and Mark climbed in one to view the vista of the island from that vantage point, and I’d say the view is magnificent. I stayed for several minutes, taking in the view and the fresh salty air as I admired the island’s beauty. I continued exploring the beach when I went down, taking a dip in the water to cool down. On our way to the next island I chatted with the two boatmen about life in the islands. They told me that Gigantes is starting to get more visitors, especially during the summer months, but they are far and in between during the off-season. Sometimes, they say, they wait for at least a month before they get passengers to rent their boat (the boatmen took turns in getting passengers, and there are at least twenty of them waiting in Carles port). They also talked about how the typhoons affected them and their town in general. We’re supposed to go to Isla Gigantes Sur next, specifically the lagoon hidden behind the limestone cliffs at the edge of the island, but seeing that there were still at least four or five boats docked at the entrance (and since it’s still low tide), we decided to do the next one and double back later. By this time I’ve almost finished the biscuits that I bought from the port and I started to get hungry. Good thing that there’s food in the next island. Our next stop is called Isla Antonia. It’s privately owned, I was told, so I paid an entrance fee of 40 pesos to get in. There are a number of residents in the island; their huts located at the middle of the beach that’s bordered by the sea on both sides. I asked Mark if they sell food there, and I was happy to hear that they did. An elderly woman who tended a small store offered me some steamed rice, a can of tuna afritada, and a humongous bushel of steamed oysters – all for 270 pesos. She set the large basket of oysters at the middle of the table and we soon feasted on them. We only finished about a third of it, and I asked Mark to bring the rest with them. After the hearty lunch I further explored the island. 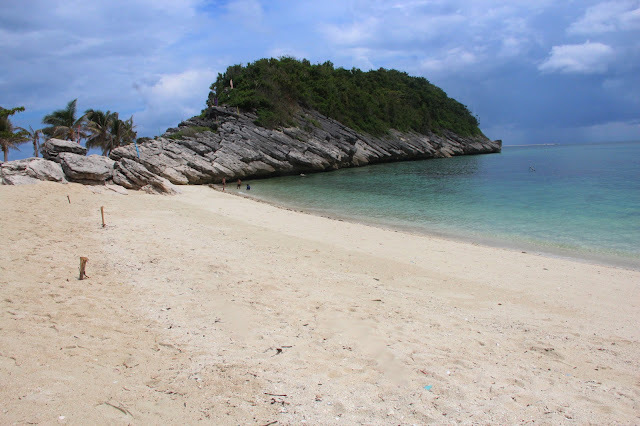 It’s almost similar in layout with Cabugao Gamay – longish shape with a white beach in the middle and two outcropping of rocks on each end. The geological formations are rather interesting on one end, with layers of limestone that fell to its side like dominoes. I climbed that too, to get a great vista of the island (see the first pic above). I also went to both side of the beach, taking a dip and swimming for a bit. On the far end of the beach one can rent a jet ski, but I didn’t since it wasn’t on my budget. There’s some kayaks for rent too, but I also forgoed on that one as well. 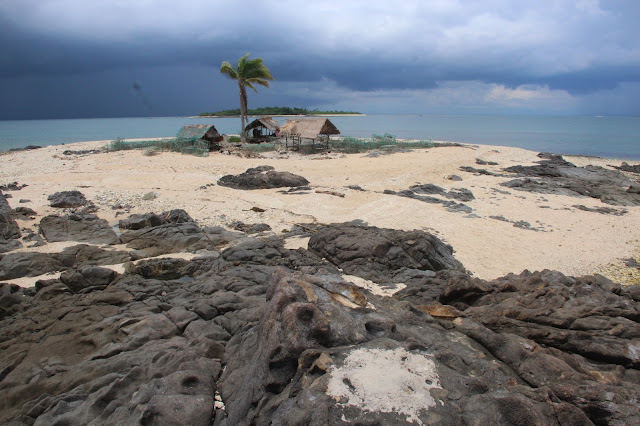 The next island that we visited is called Bantigue, and it has a sand bar that appears at low tide. Fortunately it still was when we came, unlike when I visited that one in Panglao. 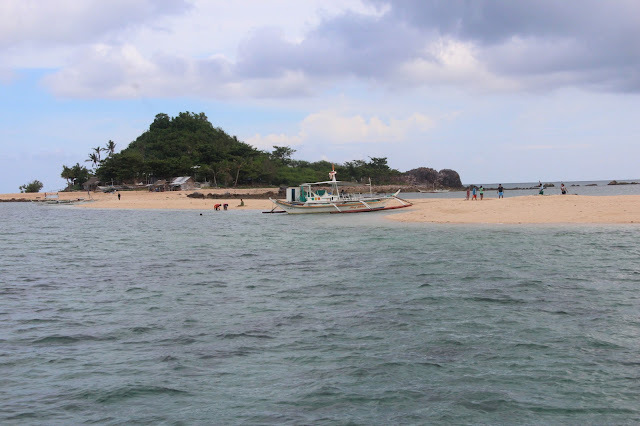 This is the second to the last island that we planned to visit, and we sort of took our time here, too, as we are waited for the tide to rise a bit so the lagoon in Gigantes Sur will be filled by by the time we get there. 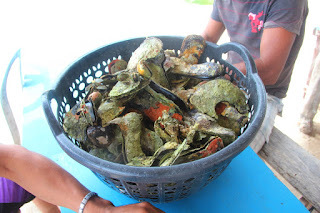 There were also residents in Bantigue, most are fishermen who gather cuttlefish and squid. I went up and down the sandbar, and went swimming too. I even took out my googles and did a bit of skin diving. There wasn’t any reef at the depth where I swam, but there were lots of kelp and sea plants just off the beach. Lots of fishes too. I also felt the sting from the things that I dreaded the most in the sea – jellyfishes and their nematocysts. I’m allergic to them, and true enough, I had strings of itchy welts when I got back. Probably not the best time to just wear speedos too. As planned we swung by Isla Gigantes Sur on our way back, and this time there aren’t a lot of boats and visitors there. 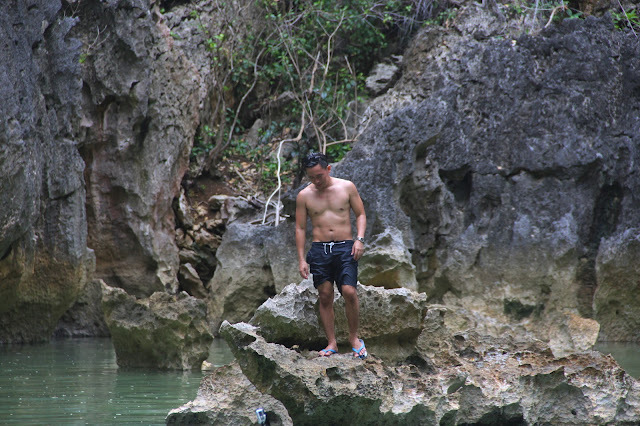 The main attraction for this island is what the locals call Tangke, a saltwater lagoon hidden behind the limestone cliffs at one end of the island. The boats set anchor on the side, one behind the other, and the passengers will have to go from boat to boat to get to the cliff. Then it was a bit of clambering up to get to the other side, to the lagoon. The limestone was sharp so I was extra careful climbing up and down. High tide was already setting in when we got there from Bantigue, so the water in the lagoon was deep enough to swim on. I went down to in and swam to the far end. I did not notice any fishes in the lagoon, but I did see a macaque gingerly swinging between the bushes growing at the side of the cliff. The lagoon itself is not as big as the ones you’d find in Coron, but it still very pretty to look at. I imagine its waters to be more cerulean if there’s the sun above, not the muted blue I see, which is perhaps due to the overcast sky when we were there. Before we set out I noticed some people cliff jumping to get down to the water below. I decided I’d want to do that too. I navigated to the side of the cliff to the spot where people jump. By then I realized that it was higher that the one I did in Ariel’s Point. Doubt set it for a few moments, then I said, heck, and jumped right in. It was scary and exciting at the same time. I swam back to the boat after I surface and we went back to the port to call it a day. There are other islands and places in the Gigantes that I haven’t explored on this trip, notably the Gigantes Norte and the caves, as well as the main settlement area in Gigantes Sur. I think I will leave those for the next trip, since I’d be definitely coming back. 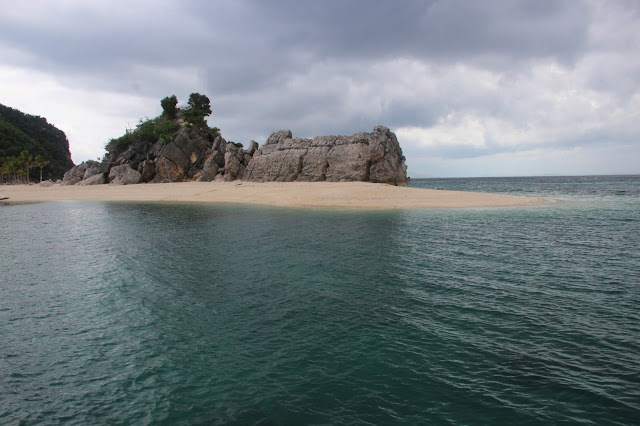 Isla Gigantes is located in the town of Carles in Iloilo. From Iloilo City you can take a Ceres bus from Tagbak Terminal (fare is PhP165 to Carles). The trip is about 4 hours. From Carles poblacion, take a motorcycle (called single by the locals, fare is PhP15) to Bangcal Fishing Port, where you can rent a motorized boat to Isla Gigantes. You may also take the bus or van from Iloilo to Balasan, then take a jeepney to Carles. Alternatively you can also rent a boat from Estancia port to Gigantes. 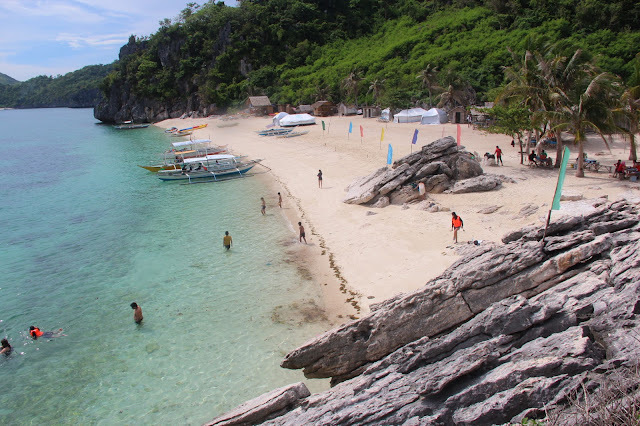 You may stay in Gigantes Sur overnight if you want to explore further and spend more time in the island. I read that you can get a homestay there for about 200 pesos but I haven’t verified this. 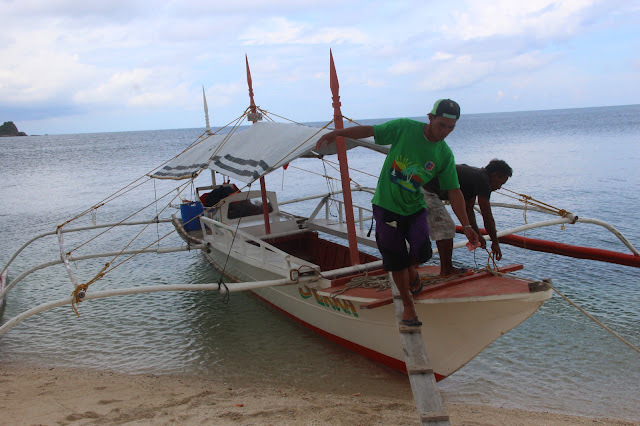 Mind that there is only one passenger boat servicing between Bangcal and Gigantes Sur. Service is limited to one trip per day, 11 am going to Sur, then coming back at 2pm the same day, so take the schedule into account when making plans. There are many resorts in Carles town if you opt to spend the night there (I did, since I came back 5pm and the last bus leaves at 4pm). I stayed in Red Mandarin, which is a beach-side resort, and I paid PhP 700 for a fan room. The boat rental varies, PhP3500 for the smallest boat (with capacity of about 8 persons), PhP4500 for the next one, then PhP6500 for the biggest. You can share the rent if you have company. I was alone so I paid for the whole amount. Tip to the boatmen is optional, but I think it’s greatly appreciated. Bring some snacks, water and sunscreen.